Modeled after the highly successful Knauss Marine Policy Fellowship, the state fellowship program provides an opportunity to acquire on-the-job experience in the planning and implementation of marine resource policies and programs in Alaska. The program matches highly motivated graduate students and recent graduates with hosts in Alaska-based state or federal agencies for a 12-month paid fellowship. December: Call for fellows. Host applications due. 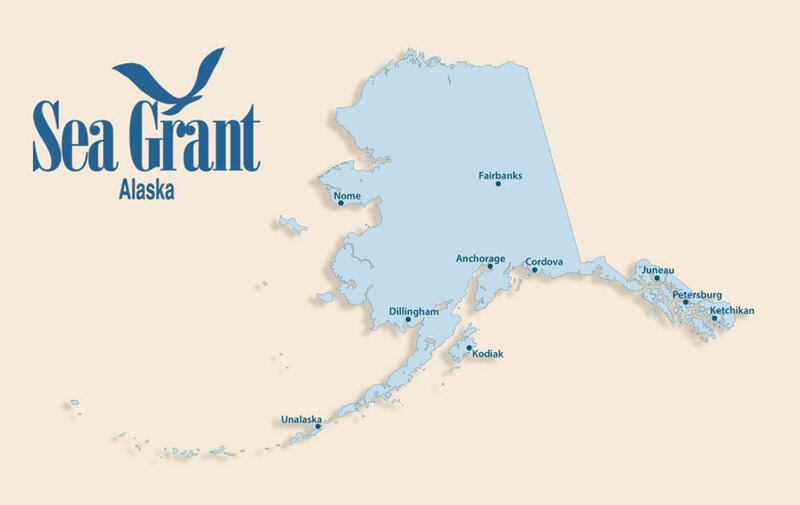 February-March: Alaska Sea Grant interviews eligible applicants; finalists are circulated to participating hosts. March-April: Match fellows with hosts. July (or later as negotiated): Begin 12-month fellowship. Personal and academic curriculum vitae (not to exceed two pages using 12 pt font). A personal education and career goal statement that emphasizes the applicant’s abilities and expectations for the fellowship experience in the way of career development (1000 words or less). Two letters of recommendation, including one from the student’s major professor. If no major professor exists, a letter from the faculty member who is most familiar with the applicant’s academic work may be substituted. Copies of all undergraduate and graduate student transcripts. Unofficial transcripts are acceptable. Questions and applications may be sent to Tara Borland, Program Manager, via email. Graduate students who are close to completing their degree or have a recently earned degree in a relevant discipline can apply. Applicants must be U.S. citizens, and in good academic standing while completing their degree at an academic institution. Alaska residents and students completing their degrees at Alaska institutions will be given preference. Each fellow will receive $42,000 in stipend for the twelve-month assignment ($3,500/month). Additional funds will be available to cover travel for interviews and fellowship-related activity. Additional travel associated with the fellowship may be covered by the host agency. Fellowship income is taxable; please contact your tax advisor or the Internal Revenue Service for current information. The length of assignment is 12 months and is nonrenewable. The fellowship starts July 1, but other schedules may be arranged. Successful applicants will interview with Alaska Sea Grant representatives via video conferencing. Finalists will be chosen and matched with several of the host agencies for final interviews. After all interviews are completed, placements will be determined. The amount of fellows placed each year is dependent upon available funding. Not all finalists receive placements, not all hosts receive fellows. Hosts of a Sea Grant Fellow are expected to supervise, mentor, and provide opportunities for involvement in substantive issues that contribute to the fellow’s professional accomplishments and goals. The fellow will be expected to participate at a full-time level within the host office and work on site and with other staff and/or agency leaders, as appropriate. Alaska Sea Grant will recruit fellows through February with the goal of placing two or more highly qualified fellows within compatible agencies or offices with a start date of July 2018, or later if negotiated. Hosts are not guaranteed a fellow will be placed in their organization. Where will the fellow be working? Host agency, division, unit as appropriate. Who will be the fellow’s supervisor(s)? Point of contact for Alaska Sea Grant, prospective fellows, and finalists. Confirm ability to meet required financial contribution. The position description should not exceed 2 pages, single-spaced. It will be made available on our website and to prospective fellowship applicants. Each fellow will receive $42,000 in stipend for the twelve-month assignment ($3,500 per month). Additional funds will be available to cover travel for interviews and fellowship related travel. Additional travel associated with the fellowship may be covered by the host agency. UAF's standard, off-campus IDC rate of 26% applies to all costs. If you have any questions about the IDC, please contact the Alaska Sea Grant office. Once hosts are confirmed, they are expected to work with Alaska Sea Grant and UAF’s Office of Grants and Contracts Administration to put into place a cooperative or interagency agreement for each fellowship award prior to the start of fellowships in summer 2018. For further information, please contact Tara Borland, Program Manager, (907) 474-7014. Position descriptions for the 2019 Alaska Sea Grant State Fellowship opportunities. Placements are dependent upon available funding, and not all hosts are guaranteed fellows. Assist with providing technical advice regarding actions of the North Pacific Fishery Management Council, evaluate Alaska’s port sampling program, and characterize crab bycatch and consolidate temperature data for use in fisheries management. There are three separate opportunities at NOAA AFSC. Auke Bay Laboratories — Juneau Support the Arctic Integrated Ecosystem Research Program and support the development of marine aquaculture in Alaska. Auke Bay Laboratories — Juneau Support the NMFS Genomics Strategic Initiative in establishing Next Generation DNA sequencing. Resource Ecology and Fisheries Management Division — Juneau Work with NOAA researchers and the North Pacific Fishery Management Council to prepare guidance about how social science is gathered, interpreted and incorporated into analyses to inform fishery conservation and management actions. There are two separate opportunities at NOAA Fisheries Alaska Region. Habitat Conservation Division — Juneau Assist NOAA Fisheries with their habitat conservation and fisheries management needs, including the synthesis of environmental data to develop habitat variables and statistical analyses of habitat data. Protected Resources Division — Anchorage Work with NOAA on several projects including a Cook Inlet beluga whale citizen scientist project, beluga monitoring research and developing outreach materials for sighting data of North Pacific right whales. Support several management projects including lagoon monitoring, ocean acidification monitoring, and the development of digital image libraries for zooplankton/phytoplankton monitoring. Work as an assistant fishery analyst supporting biologists and economists in the analysis of pertinent issues to fishery management plan development and amendments. Work on projects including hazard mitigation modeling and planning, marine and freshwater fisheries research, data maintenance and assisting the Arctic Council, Conservation of Arctic Flora and Fauna working group.